At least once a day (usually more like five times a day) strangers politely make this comment to me, "WOW, you've sure got your hands full!" I usually smile (through gritted teeth) and say, "Yep. I do!" Occasionally people ask me this one. "Wow, are they all yours??" Next time someone asks me that I'm going to respond by saying "No, actually I just borrow random LITTLE kids to take to the store with me because I think it's FUN!!!" Except that occasionally it really is fun. Or at least parts of it are fun. Like this trip to Costco. I wish I could have videoed people's reactions to the kids laying under the cart. We were turning heads and gettin' whispered comments... kind of reminded me of this post. Oooh, I really love the new blog design. Very cool. 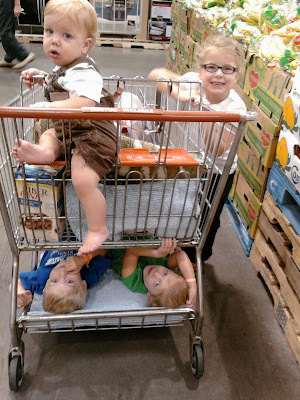 And the twins really know what's up when it comes to grocery shopping; taking it easy under the cart is really the only way to go. I hate grocery shopping. I don't know when benson saw the "low-ride-er" picture, but he is constantly trying to ride under the cart and he always says "but Lila does it". If he sees Abby and Zack are doing it, it's going to be all the rage again. Especially since benson would follow Zack anywhere and do anything Zack did. I'm proud of you for being so brave, Em. Nick and I just laughed so hard at the pictures of your toddler twins. We can hardly believe how chubby Abby and Zack looked. I think it is funny that your kids ride in the carts the way the do. Funny stuff. You know, if you tell me when I can come visit you I can tag along and you can blame a couple of the kids on me. My new response I want to give to everyone when they ask "if they are all mine" or "if we plan on having more" is "yep, we are trying to catch up to the Dugger family and get our own reality tv show"! Fun Times! What goes around comes around. I was always proud to answer yes, they are ALL mine and Wayne's) I wish I could take your 4 to the store with me. :) So fun! You're doing a great work, Emily! They may not get it, but I do! And God certainly does. My mom calls young motherhood "celestial kingdom boot camp." When you feel the burn that's when you know, the change is happening! hahahahahaha! Your kids are adorable. I'm starting to get the same comments. I don't think I'll be leaving my house though will all my children...I'm getting a little scared! You do it so well though!